Ipswich24 Magazine is the leading free entertainment, lifestyle and leisure magazine for Ipswich, Felixstowe, Woodbridge, Stowmarket, Hadleigh and surrounding areas. Established in March 2007 by Fizzwig Designs, Ipswich24 magazine has become a “Must-have monthly reference guide”. 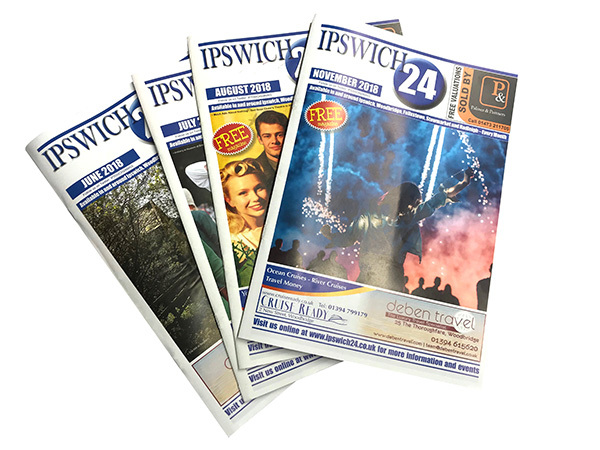 If you’re looking for something to do for a day out with the family or a night out with friends, you can guarantee you’ll find something within the pages of Ipswich24 Magazine. Ipswich24 also regularly includes celebrity interviews, plus in-depth articles on forthcoming events. Dedicated special features including Health and Wellbeing, Homes and Gardens, Wedding Guides and local business profiles are also included within the pages of the magazine. Plus each month, there are great free to enter competitions offering fantastic prizes including tickets to local events, stage shows, books, CDs and much more. All this and much more, and best of all Ipswich24 Magazine is FREE!